Truro City boss Steve Tully has urged his strikers to improve their goalscoring rate. 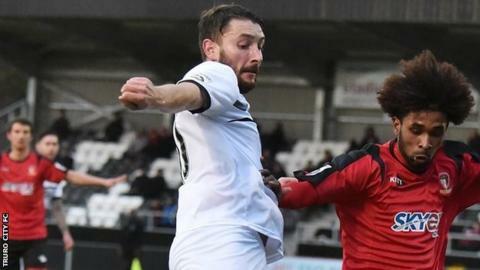 The White Tigers' 11-game unbeaten run in National League South was ended by a 2-1 loss at Maidstone last week. "I've spoken to the forwards this week and said we need one of them to step up. "The reason they're paid well is because they've got the responsibility for putting the ball in the back of the net," Tully told BBC Radio Cornwall. "I trusted them last year, I believe in them and I believe one of them will step up and go on a little run because that's all we're lacking at the moment." With Jamie Reid returning to Exeter City after his loan spell, Tully has put the onus on Matt Wright, Craig Duff and Isaac Vassell to get among the goals. "Last season Craig Duff went on an unbelievable run and he ended up with 22 goals, Matt Wright chipped in with 16 goals, Isaac Vassell got 20, so you look at all those stats and think 'someone's got to step up'," he said. "I believe in their ability, I think they're doing everything but score at the moment, their holding the ball up, they're linking up, they're making the right runs, they're just not sticking the ball in the back of the net, and we need that."